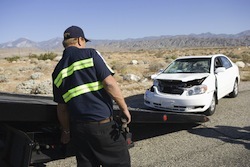 Towing-Related Accidents | Nashville Truck Accident Lawyers The Law Offices of John Day, P.C. Each day, our roads are filled with countless towing vehicles. We all notice the tractor-trailers that cover our roadways, but you share the road with many other towing cars and trucks every time you drive. Rented moving trailers and moving trucks, boat trailers, car trailers, towed lawnmowers, campers, horse and other animal trailers, flatbed trailers—the presence of each of these on the road increases the risk that you may be involved in an automobile accident. improper use of hitch or other connection device. A towing-related accident is more complicated than a run-of-the-mill car wreck. First, multiple parties may be at fault, including the driver, the owner of the towing vehicle and/or towed trailer, any rental company that was involved, and potentially certain product manufacturers. Second, state and federal laws may come into play. If the accident was with a commercial vehicle, an experienced lawyer will be able to investigate and determine whether the vehicle complied with applicable federal regulations. Even if the vehicle was non-commercial, state statutes may apply depending on the type of trailer involved. These determinations are critical to ensuring that you get the compensatory damages and, if appropriate, the punitive damages to which you are entitled. If you or someone you love has been injured in a towing-related accident, it is imperative that you contact one of our award-winning attorneys for a no-cost, no-obligation consultation. You can be certain the insurance companies representing the driver and any other at-fault parties will immediately begin working to minimize the compensation you are given. By hiring one of our experienced attorneys, you will level the playing field and help ensure you get the maximum compensation reasonably possible for your case. We handle all accident cases on a contingency basis so we only get paid if we recover money for you. Before you do anything on your towing accident case, call us anytime at 615-742-4880 or toll-free at 866.812.8787 or contact us online.